This post is prompted by the regular weekly update I get from the BC Green Party. Adam expressed deep disappointment that the BC NDP has left everyone hanging on ride-hailing once again and discusses solutions. Followed by two buttons each labelled “Read” which do not link, as you might expect, to a Green Party new release or position paper. One links to an article by Mike Smyth in The Province ten days ago and the other to one by Keith Baldrey in Burnaby Now. Neither is either fair or balanced, has any reliable data source but is mostly about slagging off the NDP. The B.C. Green party has been calling for ridesharing to come to B.C. for years now. Last week, B.C. Green MLA Adam Olsen told me the rest of B.C. is “being held hostage” by the existing industry and those key swing ridings. So no discussion of solutions there. Which is actually contrary to some genuine recent research. You could read about that in the Washington Post but I do have to warn you that you might hit their paywall, but never fear you can actually go to the source Mike Schaller a former deputy commissioner for traffic and planning at the New York City Department of Transportation. That link takes you to a useful summary and also to the pdf for the whole study. That has not been the only coverage of Uber last week: Uber and Lyft are facing a major crackdown in New York City was the headline from The Verge. New York City officials are moving to restrict the number of Uber and Lyft vehicles allowed on the road as part of a move to contain the massive growth in the for-hire vehicle industry that has been blamed for worsening congestion and low wages for drivers. Which even though it was reported widely seems to have escaped Mike Smyth. Which seems to ignore the availability of the Canada Line at 11pm – and Uber’s willingness to switch on surge pricing whenever there is a chance of a quick buck or two. On the whole I wish there were much more emphasis on expanding transit and increasing the range of services that are on offer in BC. There are, of course, many local variations of ride hailing apps – many of which encourage the use of empty seats on vehicles already on the road. A sort of electronic version of hitch hiking – which, of course, remains illegal in BC. We don’t just need more buses – though that would help – we also need to give buses priority in traffic, recognizing their vastly superior carrying capacity – people per lane per hour – and also their ability to reduce greenhouse gas emissions over the present vehicle fleet which remains almost entirely fuelled by fossil fuels. The Green Party also ought to be pushing hard for more intercity bus services, as well as light rail, and making better use of the existing rail networks by requiring more passenger trains and pushing more of the freight trains into overnight service. That was, after all, the model successfully adopted in Ottawa when they ventured into local passenger train service. Frankly I think the promises made by Uber and Lyft have been shown to have been as deceptive as those of the pipelines and LNG. Not to mention hyperloop. Former federal budget watchdog Kevin Page will deliver a blunt message to premiers this week about the costs of a future national pharmacare program: if Canadians want one, taxes will have to go up. To which I responded that it wasn’t actually necessary to raise taxes. All we have to do is stop subsidizing fossil fuels (something Canada does excessively and compulsively) and bailing out Kinder Morgan – which is also quite a needless waste of billions. Then I got into a similar grouch with Bowinn Ma (who is actually one of the better ministers in the current BC government in my opinion) over the Auditor General’s scathing report on how we are doing in our attempts to reduce greenhouse gas emissions. Once again, BC need not build Site C, nor do we need to subsidize LNG. The present plan to open up a new plant in Kitimat being no more economically viable than the earlier ones despite a slight firming in LNG prices. The release of methane from fracking alone is reason enough to call a halt, but the lack of revenue and the paucity of employment in the new plant also make the whole idea look very odd for a province that is looking to cut its carbon footprint. If we were pursuing renewables and a distributed system – not trying to create a bigger grid and a dodgy megaproject, we could be enjoying the sort of benefits that California, Germany and even the UK are experiencing. But the story that made me think I did need to start writing was a tweet I seem not have kept which cited Rob Shaw in The Sun about the demise of Greyhound here and what it means for BC. “Hold on to your wallets” was that message – I did a trawl of the hashtag and although I didn’t find the one I wanted there are plenty like it. Likely, some sort of cash will need to be offered for remote routes where passengers are sparse but transportation is a vital matter of public safety. And why not? The province already subsidizes B.C. Transit in urban areas, TransLink in Metro Vancouver, B.C. Ferries on the coast and inland ferries elsewhere. Certainly, a case could be made to financially backstop rural bus service, too. Expanding government control of buses will easily cost tens of millions of dollars and further pressure the provincial budget. The drivers and workers will want to be unionized. A new fleet will need to be purchased. And don’t expect the provincial government to be as nimble, quick or innovative as the private sector. If you thought Greyhound was intransigent, wait till rural B.C. has to deal directly with the provincial bureaucracy for its bus schedule. Between 1972, when cheap bus fares were introduced in Sheffield, and extended to the whole of South Yorkshire from 1974, and 1986 when our buses were privatised, we had an excellent and very well used bus service. Pauline Gaunt’s claim that bus use was declining before deregulation and privatisation is a travesty as far as this part of the UK is concerned. Yes, the buses were subsidised, but all the fare money went into providing frequent, reliable and affordable services, not into the pockets of private companies, and our electors voted year after year to pay the extra rates for a service they valued. It seems to me that people are not actually opposed to taxes. But they do question how comes there are always funds for idiotic things we definitely don’t need but never enough for essentials. It bugs the heck out of me that also today MoTI put out a request for bids to build “and finance” the replacement Patullo Bridge. Did we learn nothing from the last bridge financing fiasco? And then at the end of the day comes a new piece from The Narwhal. I mean, yes I knew we were on the hook for the mine clean ups. What I did not realize is the entire country seems to be throwing away our irreplaceable resources for a pittance. I mean even Burkina Faso seems to strike a better bargain than we do. So I am not going to listen to “budget watch dogs” who think that we ought to pay more in taxes for essential services like medical treatments or rural public transportation. It’s the corporations that should be paying. Just like the Norwegians get far more for their oil and gas than we do – and invest it better too. We need to be looking much harder at how resources are being extracted and how much of that flows back to the people. Not off shore to some tax haven for the benefit of 0.01% of them. There was a Press Conference held at City Hall at lunchtime today, while the rest of the world was watching a football match. I did not speak on camera but I am hoping that I will be able to link to both the CBC coverage and Jen St Den of the Vancouver Star Metro in due course. Description: The proposed amendment to the existing CD-1 (642) is to permit an increase in the maximum allowable floor area across Block C and D, from 67,065 sq. m (721,881 Sq. ft) to 77,611 sq. m (835,400 sq. ft.); and an increase to the maximum building height on Block C from 57 m (187 ft.) to 60 m (197 ft.), and on Block D from 57 m (187 ft.) to 72 m (236 ft.). The proposal is being considered under the Arbutus Centre Policy Statement. The application was reviewed by the Urban Design Panel on February 26, 2018, and was supported with recommendations (see Appendix C). Staff conclude that further refinements are required to the design as conditions of the rezoning amendment as noted in Appendix B. A reduction of density on Block D is anticipated through design development. The applicant has proposed to replace this floor area by adding a penthouse storey onto the eastern wing of Block A through a Development Permit amendment. So now I have two documents, essentially saying the same thing. The project was reviewed and a number of concerns identified. • Balance distribution of density between the two parcels; the density may need to be reduced to achieve appropriate massing and to mitigate the overshadowing. • Further design development to the view analysis to include roof top structures and mechanical RTUs and to review how they impact the view. The height may need to be reduced to preserve the view of the North Shore Mountains. Related Commentary: There was a panel consensus that the original concept was the preferred choice. The second concept was a big change from the original. The original application was a better fit and blended in smoother. The current concept is too bulky especially with building D.
Then panel agreed there was a very significant addition of height and density being absorbed mostly on the western parcels which created a misbalance. The original concept was lost because the additional density has been dropped on one block, and should have been better distributed. A consequence was a large parcel created that is out of context. A panelist noted there were fundamental issues with planning and massing of the entire space. If massing is properly planned in the first phase there would be better relation. There is a loss in transition down to the lower scale units. A panelist noted the site is in a real bowl which could be to the applicant’s advantage. Moving forward with the architectural expression the strong parti concept has been diluted as well. In the earlier models the parti was cleaner and simpler. A panel member suggested looking at the elevations to determine if they want to be closer or completely different from what is across the street. The elevations should be revisited to be a lot cleaner without losing elevation and height. 7 to 12 storeys created significant shadowing on the park, open space, and street. Yew Street will be completely shaded in the afternoon. The impacts are also significant on the view. Viewpoint is important and cannot be ignored. A big bulky building has a lot of negative effects on the neighborhood; in this case Main Street is too over shadowed. There are intrusions to public views in the City of Vancouver all the time however these issues are on the whole block. Building C, on the west façade has so many different fenestrations and proportions. In general a calmer and boulder contemporary expression would be more successful. A panelist noted public views can be better distributed back to building C.
Just to be clear “parti concept” refers to the idea that this development has to fit into its surroundings. ” The parti is a simplified version of the plan, and it describes the overall configuration or organization of the building.” is one of the definitions offered. It seems to be inconsistent to approve a building – but with the observation that it does not fit into its surroundings. If planning is supposed to achieve anything at all cannot it be at least based on a simple concept – does it fit in? This illustration shows most clearly what has changed since the original proposal was approved. This building is much too big for this site. And this table shows the figures for dwelling units over all four parts – which I am afraid got a bit confused during the press conference but are in fact not confusing at all. Council policy was recently changed to require 30% social housing units in large scale developments, but Larco are still only offering 20%. And just in case you were wondering what “affordable rental units” might cost I have replaced (July 17) what was here with something more reliable. In the case of the 2109 West 35th Avenue development, Baker said that renters must have an annual income of $150,000 to be able to manage paying the rent for a three-bedroom unit at $3,702 per month, based on the 30 percent affordability threshold. So don’t go confusing “affordable” with “social housing” – they are quite different and should NOT be added together. Even so, staff are still recommending adoption, because of the $2m now being offered towards the Arbutus Greenway. As was pointed out in discussion today, there are plenty of examples of developers being required to meet different specifications as a condition of approval, who manage to complete their projects and casually ignore these requirements with no penalty. It really seems odd to me that staff would recommend approval of a project which raises so many concerns. A much safer approach would be to deny the application for expansion, but suggest to the proponent that this proposal needs to revised and then resubmitted once these concerns have been dealt with to the satisfaction of staff. However, the concerns of building height and massing are such that they cannot be reasonably accommodated just within areas C and D, and A & B are now under construction so that the only changes could be made there would be on the allocation of units between the market/rental/social/affordable classes. No building recently approved along Arbutus Street is over 6 stories: not the Ridge (at 16th Avenue) nor the recently completed block at 49th and West Boulevard. Approving a 12 storey building sets a new standard which will undoubtedly be embraced by developers on the half dozen or so sites around Arbutus Village which are either already acquired or on the point of being so. We accept that there is a need for more housing on the West Side in general, but dumping all of it on Arbutus Village seems a bit much. We, the undersigned residents of Vancouver, call on City Council to respect due process and community input, and to reject the rezoning amendment for 2133 Nanton Avenue (Arbutus Centre), which goes to public hearing on July 18th, at 6:00pm. The application seeks to add 127 new units to the development and to increase the maximum height from 8 storeys to 12! 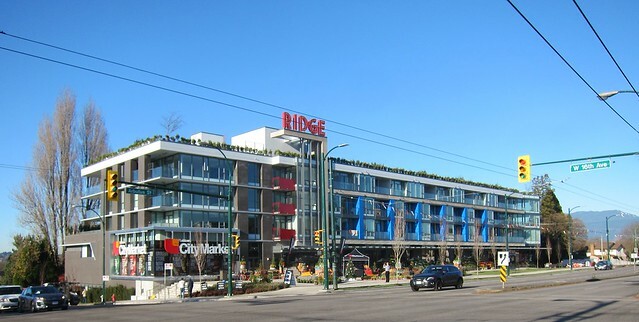 The developer’s stated rationale for their application is to provide more housing in the midst of Vancouver’s housing crisis, but even with the new proposed social housing and below-market units in the amendment, the majority of the development will still to be out of reach for lower and middle-income residents. If Council approves the amendment, they will be backtracking on a 2011 rezoning agreement based on years of community consultation in exchange for a negligible contribution to affordable housing. In order for residents to be able to trust the city and its planning process, Council should vote NO to the Arbutus Mall rezoning! You could also print off the text above and add signatures, names and addresses below and send to City Hall.